I'm a Yank who stays up Friday and Saturday nights from February through September to get my fix o'footy. 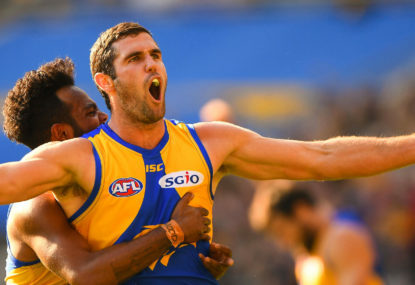 Cameron Rose wrote last Tuesday about the five teams he felt were the most legit contenders to focus on this season, and they were the most obvious choices: Geelong, West Coast, Collingwood, GWS and Brisbane. 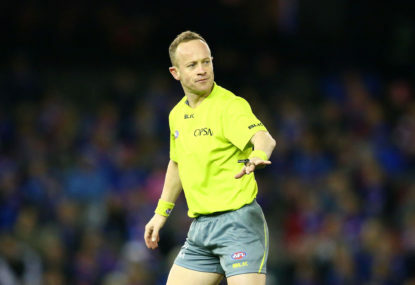 Are the AFL's new rules working? I was raised to never talk about religion or politics in public yet these days I discuss both of them professionally. So let’s talk about the umpiring of the new rules this season. 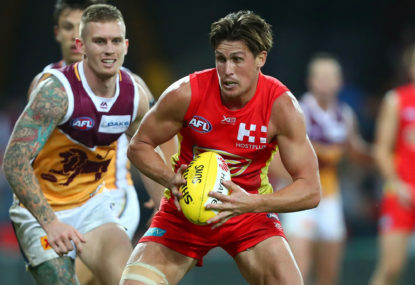 Is the Gold Coast surge another mirage? Gold Coast were supposed to be the easy-beats this year. 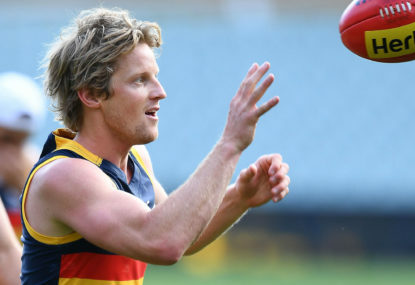 Before their one-point loss to St Kilda, they were 25-point underdogs on the road. Each year, I try and track not only the team ratings and performances, but also how individual players are performing as recognised by both media and coached, as well as the statistical and fantasy metrics. 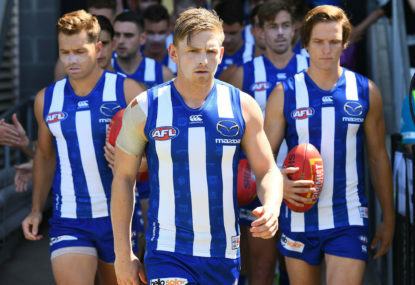 If you flipped a coin, had your six-month-old choose teams by red or blue coloured bottles, or picked the teams whose mascots most resembled the random Wikipedia entry chosen for the game, you’d most likely have hit either 13 or 14 of the 27 games played so far in the AFL season 2019. Watching the Sydney-Carlton game on Saturday afternoon at Marvel Stadium, what struck me more than anything else was the difference between a veteran team and a young team. 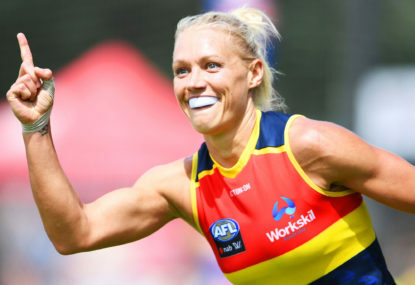 Is there a better female athlete in Australia right now than Erin Phillips? 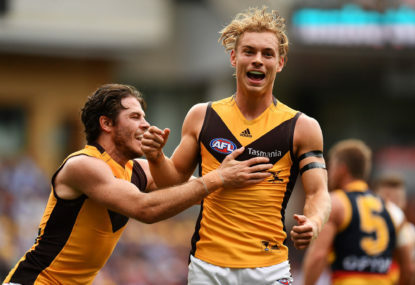 Coming into Round 3 of the AFL season, here’s the pecking order for the 18 clubs in both our ‘ELO-Following Football’ ratings and the composite meta-ranking of eight distinct computer systems. What effect does the start of the season have on your team's finals chances? 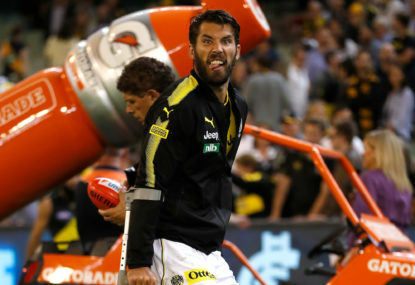 The first great game of the season took place Thursday night at the MCG. 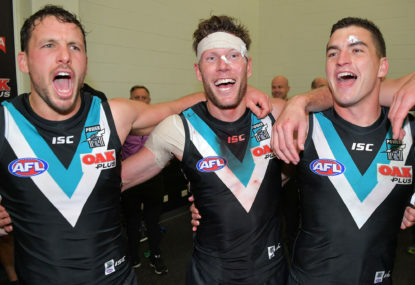 For the first time in AFL history, eleven premiership games were played across the two leagues – two finals games for the women and nine season-openers for the men. I was watching the Fremantle vs Carlton AFLW finals match on the weekend, and as the Blues surprised me and most AFLW aficionados by utterly dominating the favoured Dockers, I found myself considering the recent travails of their star forward, Tayla Harris. The early reports looked bad. If you follow my writing at all – and why wouldn’t you? – you already know which teams I’m likely to tell you to expect to be 1-0 one week from now. 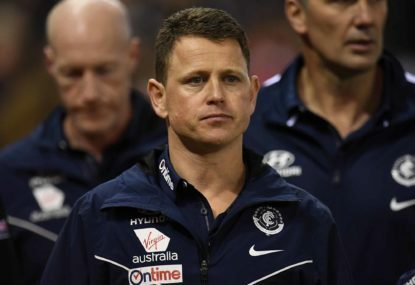 As the lady Bulldogs were trying to come back on Carlton in the fourth quarter on Sunday, the commentators were interrogating each other as to which players had gotten worse since the previous year’s premiership season. I saw a column on a competing site discussing not the players the editors considered to be the best, but rather the ones they were most excited to see in 2019 for a variety of reasons. At Following Football, we start with the end-of-year ratings from the prior season and make some standard minor adjustments. Going into the last week of the women’s season before the first AFLW multi-game finals series, seven teams are still eligible for a top-two position in their conference ahead of Round 7 this weekend. Roctod, I think your reference to the Myths is particularly prescient here. Nice article, Ben. More “coverage”, please. I’m particularly impressed by the subtle, gradual reveal of how far the tongue was firmly planted in the cheek throughout the article. This was gauged, I can exclusively reveal, by the subtle yet steady and gradual growth of the wry smile creeping across my face as I began to realize exactly what the target of the needle was. Outstanding work, Ryan. That was my best guess too, but it didn’t fit the pattern of the other “errors”. But thanks for the confirmation, Cat. Sorry for the length of that story, friends – but without that story, the entire premise of the article is lost. This is a different situation than those other six years, in my opinion. THESE Suns have a shot to stay afloat in August. I don’t know that they will, but they’ve got a better chance than their predecessors. So, many of the seasoned musicians quit after my first year there. What I was left with were about four of the “good musicians”, but the vast majority of the novices with a year under their belts, plus a host of “recruits” I’d trained from the junior high school program who were now first-year high school students. The key was that every one of them WANTED to be there and had “bought in” to what we were trying to accomplish. We ended up with about the same sized band, but suddenly the program was significantly better and achieved a great deal more, despite the apparent loss of talent, because now every member was “rowing in the same direction”, so to speak. In a typical locker room or clubhouse, you have about ten percent who lead WITH the coach; ten percent who lead the rebellion AGAINST the coach, and eighty percent who decide which set of leaders to follow. The numbers may vary, but the principle stays true. After that first year, my rebellious leaders were gone, and suddenly, the team was freed to accomplish so much more than when people were pushing in different directions. I look back on the 1993 year as one of the most successful programs I taught in my thirty-year career. Last year (and maybe ALL of the years before that), there were key players who simply didn’t want to be in Queensland. Now, I can’t think of one. And it shows in the way the play this year – unselfishly, making the extra pass to a player who can do more damage or score more easily. They throw their bodies into the fray, they fight for every inch of grass. The only team I can absolutely say they won’t outwork this season at this juncture is their neighbor up the coast – and I cannot WAIT to see the next Q-Clash in round six! I can verify that in principle your suggestion is correct. In practical terms, I don’t know what the critical number of “exceptional” players would be – it probably depends on the definition of exceptional. I can tell I’m a math geek, because I’m excited at the prospect of crunching the numbers to find out! Thank you uoy knahT, Doctor Rotcod! Ryan – excellent article as always; insightful as usual; and discussion-provoking as preferable. But frankly, it reads like some of my wife’s texts when she’s driving and having to use her speech-to-text software. “Charters” instead of quarters, “abstracting” instead of subtracting, and I don’t know what “It had to rip it” was meant to be. Melbourne’s 30/52 numbers are frightening. I don’t see them recovering from this in time to make finals. It does seem like, more than any other teams in recent memory, the Demons and the Suns are proving this early season that there really isn’t much difference between the top and the bottom of the league. 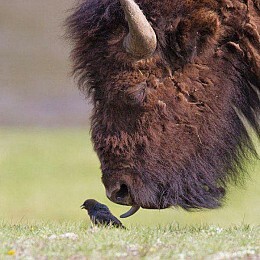 It’s mostly a matter of the mental things that lift a team up or knock them down. 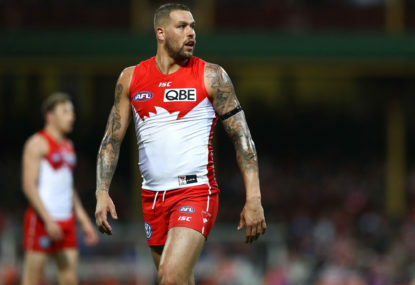 What do you think of Kane Cornes’ comment last night that Carlton has gotten too accepting of “respectable losses” to do what it takes to get over the hump and beat teams like a weakened Sydney at home? 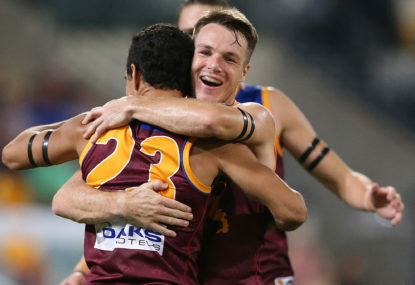 I don’t personally agree with him – if they continue along the Brisbane arc this season, I can see them moving into the win column on a regular basis in 2020, as I said in the article – but I think his point is at least surface legit. As always, great writing. Love the GF angles. I didn’t know about the bloodbath game back in WW2. Liam Picken was always one of my favorite Dogs. But I’m happy for him that he’s getting out while he still has his faculties intact. That’s far more important than our entertainment. Thanks, Liam. I think they’re taking this too seriously, AD. Don’t sweat it. Keep up the conversation starter! Great article, Josh. Lots of detail, lots of accurate analysis across the board. Because if the Magpies continue to play the way they did last night, they’ll be getting far more than their share of love this season. A strong Collingwood team is a mammoth media presence – they won’t be forgotten. 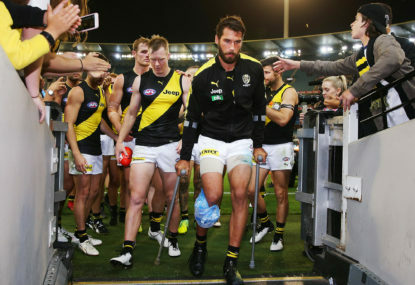 Richmond, on the other hand, may now be four weeks away from being ignored the rest of the year, primarily because of one injury. (And if Jack’s out, too? Done.) If I seemed to contradict by saying a non-competitive game would have been competitive, so be it. They didn’t have a chance to win last night after halftime; they would have with one change. That’s my position, although admittedly I didn’t want to denigrate Collingwood’s performance in saying so. Hard to argue with any of your predictions, and I’d push the margin higher myself. Thirty, perhaps. I do have a point of order about it being the biggest turnaround in AFL/AFLW history – because this is only a ten-team league (and was just eight last year), Carlton’s only moving up at most nine places, and more accurately seven from their eighth place finish last summer. By contrast, Richmond jumped from 13th place in 2016 to the premiership the next season. Geelong went tenth to title ten years earlier. (And if you want to get really weird, Fitzroy jumped from the wooden spoon to the title IN THE SAME SEASON back in 1916.) So I’m not statistically impressed by the Blues’ jump this season. I am, however, VERY impressed with their game plan change and addition of speed and skill that’s allowed them to implement that change. 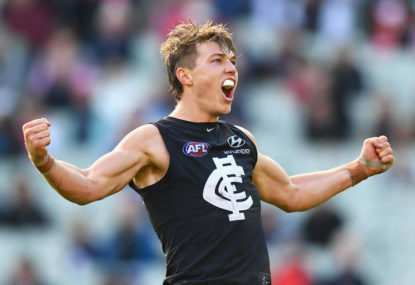 As badly as I feel for the missing 6-1 teams, I’m glad Carlton gets the chance to show this off against the best on Sunday. The symptoms of mental health issues may be all you see, but the underlying problems are all deserving of our support. And Gold Coast deserved to be higher. If we learned anything from this weekend, it’s that NOTHING is set in stone this season! You just saved me the work of putting this material together together myself! Thanks! Great work – and smart not to jump to more detailed conclusions. 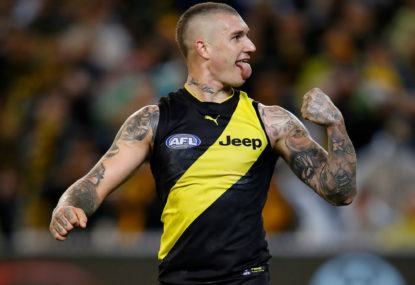 The Roar's 2019 AFL ladder prediction - as voted by you! “I can see in people’s profile pictures that they have kids or they have got daughters, or there are women in their photos – and that is the stuff that I’m worried about. “So perhaps this is an issue that might even have to go further because if these people are saying things like this to someone they don’t know on a public platform, what are they saying behind closed doors, and what are they doing? When SHE was the target of the verbal abuse, and felt the pain inflicted by those reprehensible trolls, and yet the people she’s concerned about are the women in those homes affected by the mouth-breathers? THAT is more impressive to me than her already prodigious talent on the field. Michelle Obama, former first lady of the United States, once said, “When they go low, we go high,” and Ms. Harris has proven herself the epitome of the class Mrs. Obama exudes. I want to take a moment to thank the editors at The Roar – you always make my articles look so much better than they do coming off my computer! Thanks for the care you give our work, and the opportunity to share our thoughts with the sporting public.